The ancient crusader streets of the fortified city of Valletta are preserved as if in a time capsule. The passages climb and drop, giving you vistas of balconies on Globigerina limestone buildings against the pure blue of the sky and Mediterranean Sea. A small alley houses a café that could barely fit five people. Taking advantage of its location, you walk out with a cup of Maltese coffee and a hot pastizz. Continuing down the main street in the warm morning air, you are not alone. Local Vallettans walk to work proudly clutching their pastizzi and, taking a bite, you can see how the crisp snap of filo pastry giving way to soft ricotta is a point of local pride. The inhabitants of this resilient city have much else to be proud of too. The city, nicknamed Superbissima (The Proudest), has a long history of sending invaders back to where they came from. 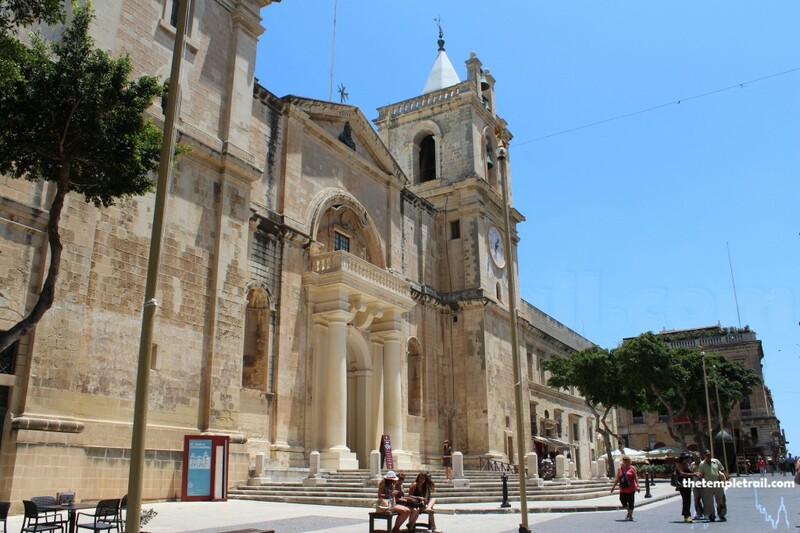 Located on the Xiberras Peninsula, the city was founded by the Knights Hospitaller in 1566, shortly after the Ottomans’ unsuccessful annexation attempt during the Siege of Malta. The Knights’ order was founded in Jerusalem in the 11th century by the Blessed Gerard Thom and continues to this day in Rome under the reign of its 79th Grand Master. The 49th Grand Master of the Order of St John (Knights Hospitaller), Fra’ Jean Parisot de Valette, laid the foundation stone of the city that would be named after him. Although he did not live to see its completion, a mere 15 years later, his memory would be secured. Walking along Republic Street, you soon come to the place where the founder was eventually lain to rest; the glorious St. John’s Co-Cathedral. 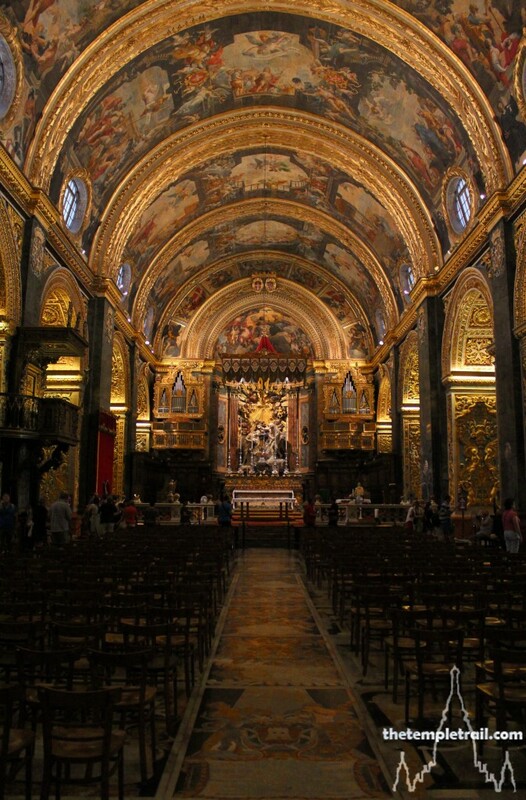 The Kon-Katidral ta’ San Ġwann, as it is called in Maltese, is a beautiful example of 16th century High Baroque architecture. Commissioned four years after the death of de Valette by Fra’ Jean l’Evesque de la Cassière, the 51st Grand Master, it is the jewel in the crown of the resplendent city. It is the reliquary of Knights and is their gift to the world. As you approach the enormous structure, the limestone façade seems somewhat utilitarian and plainly austere. The sun lights up the building and the smooth stone exterior. The fortress-like appearance tells a lot of the sentiment of the Knights following the siege by the Ottomans. On each corner of the façade, small fountains are topped with a lion and a unicorn, giving the building some ornamentation on an otherwise plain-styling. Stepping around to the entrance, your experience of the co-cathedral drastically changes. You are immediately thrown into a golden haven that tells much of the glory of the Knights and where they came from. From the minute you enter, every inch of floor space is taken up with intricate and glorious marble tombstones of knights of the Order. 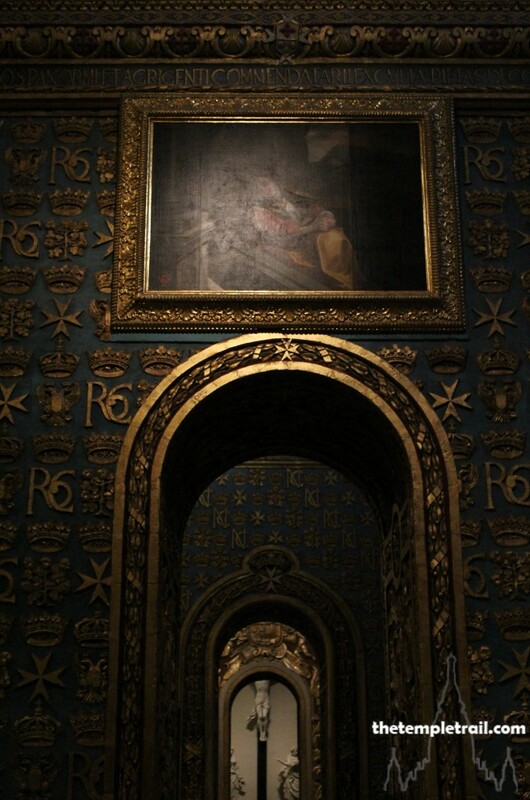 The first room you enter after turning left from the entrance passage is the chapel of the Langue of Italy. The chapels that line either side of the nave of the cathedral are dedicated to the various langues or tongues (subdivisions) of the Order. They are ranked in seniority and, here, Italy takes an important spot. 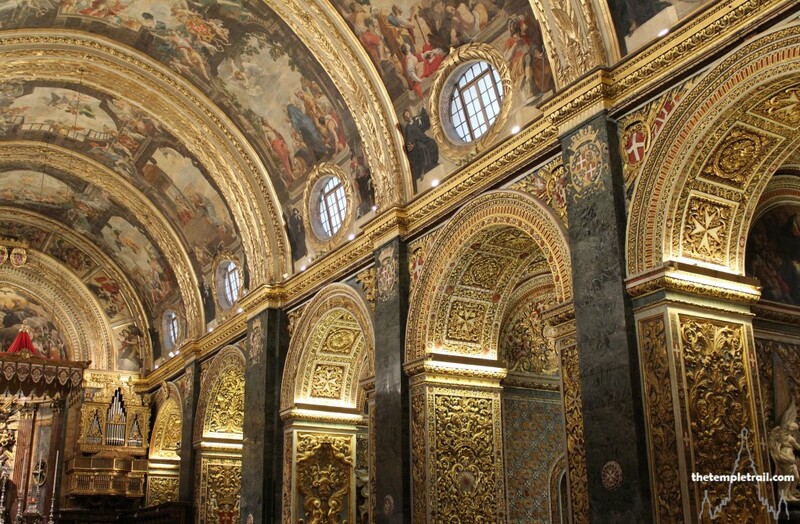 The baroque chapel is glorious and dedicated to their patron, St Catherine of Alexandria. The light blue walls are adorned with coronets, crowns, eight-pointed crosses, double headed eagles and the monogram RC (referring to the 60th Grand Master Fra’ Raphael Cotoner). The chapel is the reliquary of St Euphemia of Calcedonia, whose relics are contained within the altar. The altar painting of St Catherine is a work by the 17th century artist Mattia Preti, whose works can be found in almost all of the chapels of the co-cathedral, as he was in charge of the mid-17th century renovation of the entire complex. The chapel originally housed Caravaggio’s painting of St Jerome that is now located in the oratory. Next, you pass into the chapel of the Langue of France, dedicated to St Paul’s conversion. The altar is the second to sit in the chapel and is a simple marble construction from the mid-19th century. The altarpiece is another Preti work that illustrates the conversion of St Paul. 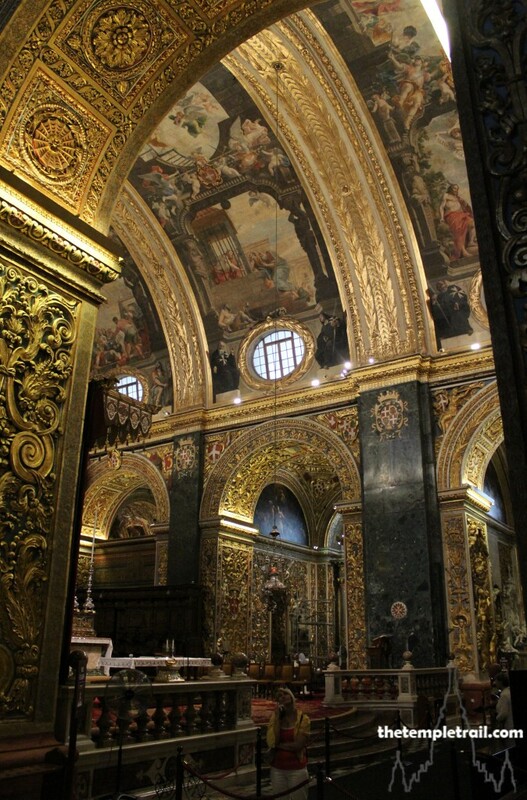 This chapel also has paintings in the lunettes (half-moon recesses above the doors) of St Paul being shipwrecked in Malta and his beheading in Rome. The simple style of this chapel allows the gilded fleur-de-lys and crosses of St. John on the walls to really stand out. The next in line is the chapel of the Langue of Provence, dedicated to St Michael the Archangel and his iconography is in the altarpiece and lunettes. At the end of the row is the wonderful chapel of the Anglo-Bavarian Langue. This chapel is sealed from public entry, so you can progress no further, but viewing it from outside affords you a window into glory. 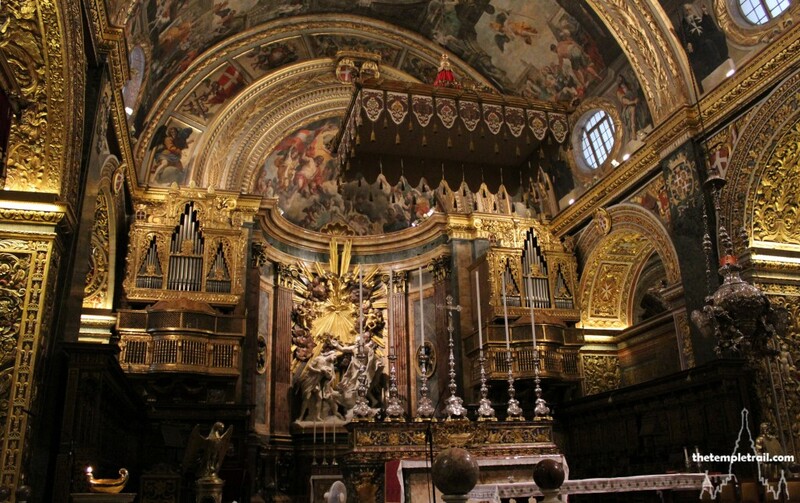 The chapel, which also acts as the entrance to the crypt of the Grand Masters, was once the reliquary of the langue, but due to humidity, the relics (including the entire remains of St Clement) were transferred to the sacristy. The altar that once sat in the oratory passage is dedicated to St Charles, as is the painting above it. The important chapel was much neglected after the Reformation in England. It was not until a late 18th century papal bull reviving the English Langue was issued that the chapel regained its significance. It is somewhat of a hand-me-down, as the altar is from elsewhere, as is the bronze gate; originally from the iconostasis (icon wall) of the chapel of Our Lady of Philermos. Double backing to the beginning of your trail, you continually glimpse through the archways to the main nave that shimmers with gold and ornamentation. At the opposite extreme of the line of chapels is the chapel of the Langue of Germany. The Langue of Germany was very important and included Austria, Norway, Sweden, Denmark, Switzerland, Poland, Hungary, Alsace and the Netherlands. Walking on the wonderful marble tombstone floor, you are encapsulated in intricate artwork. The walls are richly adorned with double headed eagles and the coats-of-arms of benefactors and dignitaries. Passing the Golgotha group of statues depicting the crucifixion, you turn right into the sacristy. The room is utilitarian, as you might expect from a functional room, and the coffered vault is a throwback to the earlier incarnation of the cathedral before Preti was commissioned to redecorate it. Old standards and flags hang from the walls in an otherwise unadorned chamber. Retreating back to the nave, you are now able to see the main chamber in all its glory. Looking down to the floor, row upon row of tombstones fill every inch of it. 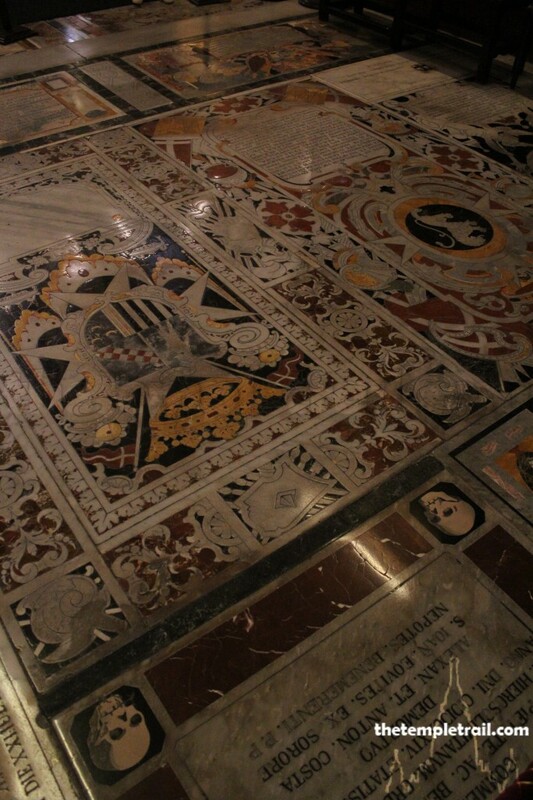 The ornate marble covers important knights who were lain to rest under the floor on which you now stand. You almost feel bad walking on them. The act of glorious humility is crowned with unbelievably splendid walls and vault. The huge nave that sits in the centre of all of the chapels is 15 metres wide by 53 long. In the mid-17th century the Grand Masters commissioned a baroque renovation of St John’s and the result is what you see before you. 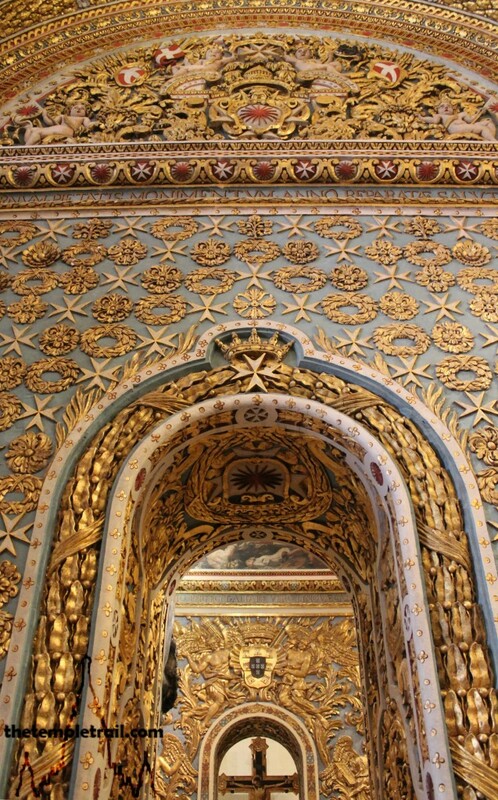 The vault is gilded and elaborately painted. Symbols of the order are carved into the stone walls that were once plain. 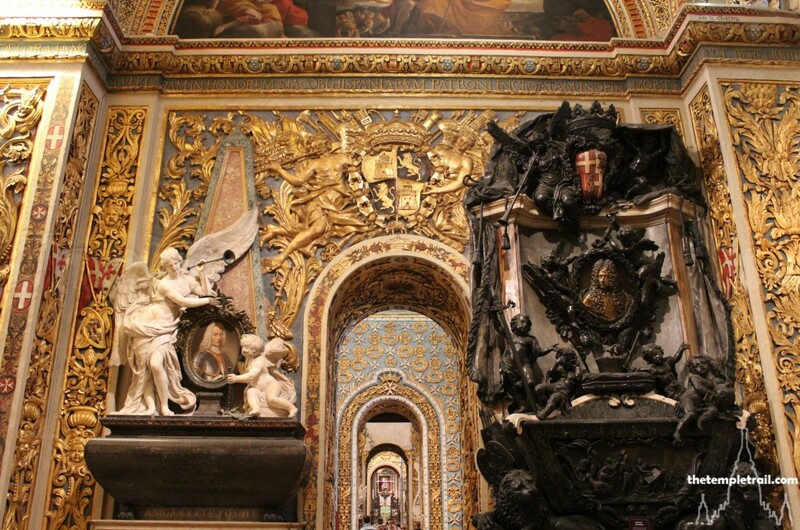 Preti designed the new baroque interior with motifs of angels and foliage framing all of the artwork. Green marble cladding on the pilasters on each side are topped with the coat of arms of the Mallorcan 61st Grand Master Fra’ Nicholas Cotoner, who oversaw all of the works, as they were done during his time in office. Other coats of arms and the Maltese Cross of St John also feature heavily. The entire work glorifies the holy military order with triumphal symbolism. 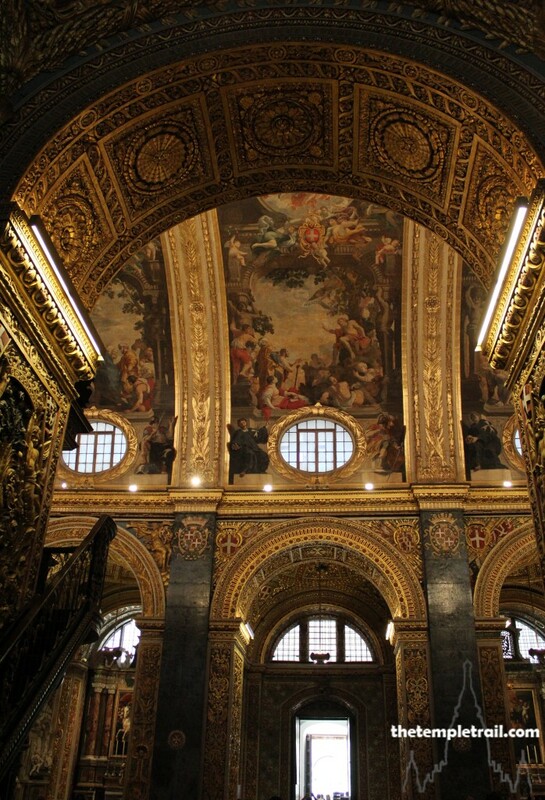 After dazzling your eyes with the golden nave, you head into the oratory via its passageway. 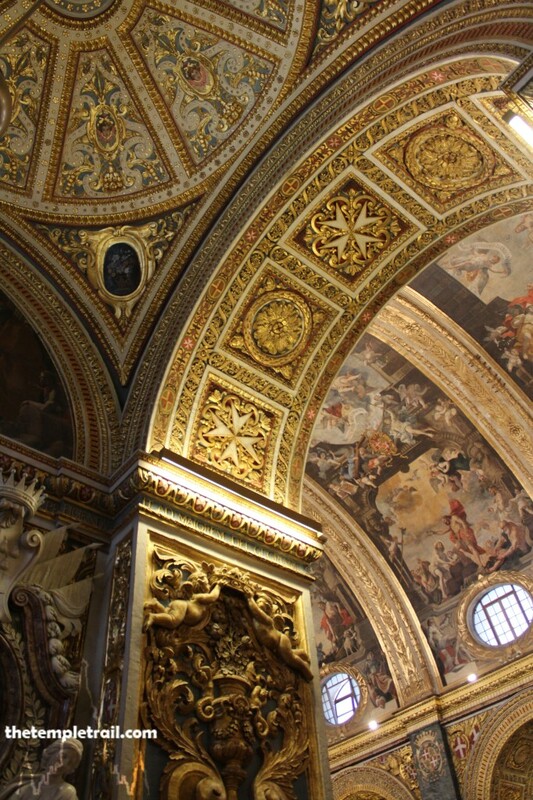 The oratory was not spared the hand of Preti either and was one of the later sections to have been renovated. The main focus of this room is not the wonderful gilding or beautiful altar, but the priceless works of art that it is home to. Aside from the marble head of St John the Baptist and the 16th century organ, two Caravaggio paintings hold pride of place. The painting of St Jerome Writing was originally held in the Chapel of the Langue of Italy and is a beautiful piece. However, the crowning glory is Caravaggio’s masterpiece; The Beheading of St John the Baptist. When the oratory was first built in the early 17th century, the reigning Grand Master, Fra’ Alof de Wignacourt, wanted a painting for the room. He engaged the services of the out of favour and notorious Italian painter Michelangelo Amerighi da Caravaggio. Caravaggio had a reputation for brawling and accidentally killing a man, he fled Rome; first to Naples and then to Malta. He was commissioned by Wignacourt and the resulting piece is generally considered to be his masterpiece. The use of dramatic lighting and realistic figures grimly depict the beheading in the style that defined Caravaggio. Looking at the painting, you are transported to the scene and also to the era in which it was painted. The talented, but tortured artist has left his indelible mark on the cathedral, despite being here for only a short time. The painting was completed in 1608 and the next year he was exiled from Malta for brawling and injuring a knight. He died the following year. Retracing your steps, you come to the row of chapels on the right flank of the nave. First is the chapel of the Langue of Castille, Leon and Portugal. 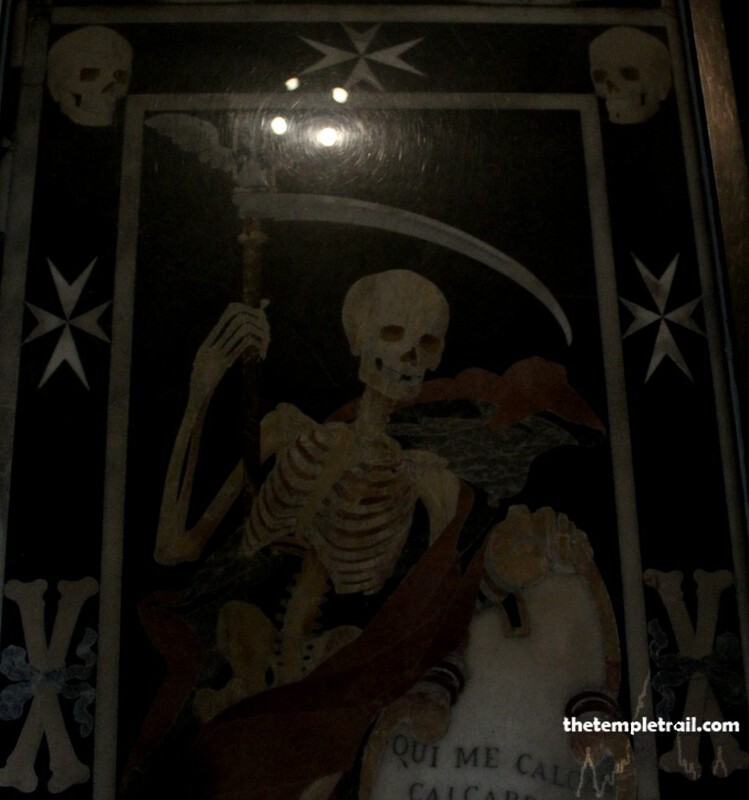 It is dedicated to St James, the patron saint of Spain. The painting of the saint is again by Preti, although it is earthy and uses darker colours than the other works. Preti also painted St James Banishing the Moors from Spain in the lunette. The next room is the bookshop passage, a comparatively modest space that is home to the oldest marble tombstone in the cathedral, that of Fra’ Jacques de Vivieu Puppettieres from 1608. Your course takes you next to the chapel of the Langue of Aragon. Aragon, along with its subsidiaries of Catalunia and Navarre, was one of the three most important langues; the others being Italy and France. Dedicated to St George, it is one of the most ornate chapels and holds the remains of four Grand Masters. The Chapel is not just rich with ornamentation, but also with relics brought by the warrior monks from distant lands. A true cross relic is kept here aside the arm of St George, the arm of St Vincent Ferreri and the body of St Fidele. It is a treasure trove of Christian relics. Moving on from the reliquary, you find yourself in the chapel of the Langue of Auvernge, dedicated to St Sebastian. Flower garlands in gilt decorate the walls as a sign of the wealth of the Order and the reredos’ spiral columns, like those in the chapel of the Langue of Provence, add a nautical feel. A crowned dolphin, the symbol of the langue, also features heavily. The chapel gives way to the last chamber of the row; the chapel of Our Lady of Philermos. The story of the chapel is long and tells of the history of the Knights. An Orthodox basilica on Mount Philermos on the island of Rhodes held an ancient icon of the Virgin Mary. Originally, the island belonged to the Byzantine Empire, but it was occupied in the 11th century by the Venetian crusaders. In the early 14th century, they sold it to the Knights Hospitaller. The Knights, who had been previously headquartered in Palestine and Cyprus, rebuilt the now ruined basilica and reinstated the icon, naming it Our Lady of All Mercies. The icon also became known as Our Lady of Philermos and the protector and patron of the Order. In the mid-16th century, the Knights left Rhodes under a truce with Suleiman the Magnificent, taking the icon with them to Malta. A mere 30 years later, Suleiman’s Ottoman armies attempted the unsuccessful siege of the island, after which St John’s was built and the Feast of Our Lady of Philermos was founded (8th of September), as she was seen to have protected the Order against the Ottomans. The chapel is now, sadly devoid of the icon. When Napoleon captured Malta at the end of the 18th century, the icon went with the Knights to St Petersburg. Eventually, the Tsar took full possession of the icon. Our Lady left Russia just after the Russian Revolution of 1917 and was taken to Copenhagen, before settling in Yugoslavia. When the Germans invaded in 1941, the icon was hidden in a monastery in Montenegro. The Yugoslav dictator Tito had it put in a museum in Cetinje, the old capital, where it was then lost. It was later rediscovered and is now on display there. Although the icon is not at home, signs of it are. Keys of capture castles were given to the Virgin by returning knights and some sets are still found in the chapel. The icon now housed here is of The Virgin of Carafa and the sanctuary that holds the reredos has a silver gate that replaced the older bronze one now found in the chapel of the Anglo-Bavarian Langue. Exiting the closed side chapels, you stand at the front of the nave before the main sanctuary of the cathedral. The main focal point of the cathedral is spectacular. 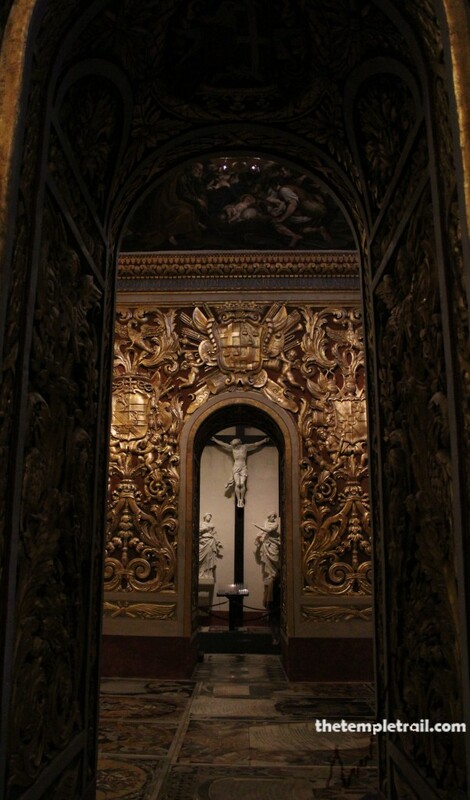 A very simple place before the Preti renovation, it now has a high altar that is wonderfully ornate. A gift from the 62nd Grand Master, Fra’ Gregorio Carafa, it is constructed of rare marble and the frieze of the Evangelists, the key of St Peter, sword of St Paul and the Last Supper is made of gold and lapis lazuli. The unique altar is topped with a crucifix and six huge silver candlesticks. The apse is glorious and has carvings of angels looking over marble statues of St John baptising Christ. Two golden organs frame the scene in a symphony of extravagant proportions. Walking back down the nave on the marble tombstones of great knights, you are surrounded with the most elaborate decoration you have seen. It is fabulous beyond words. 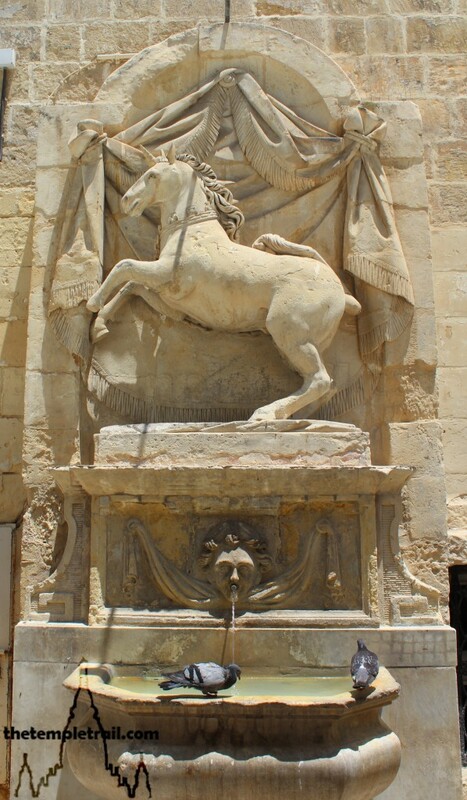 The knights may no longer be in Malta, but their mark is indelible. The bombing of the island by the Nazis during the two-year German Siege of Malta, some of the heaviest bombing in history, failed to erase the Knights’ legacy. The island yet again withstood an attack from a larger enemy force, earning the entire country and population the George Cross for valour. Stepping out of the cathedral and into the sunshine, you feel humble to be in the presence of such a noble set of people and fortunate to have been given an opportunity look through a window into their past. Walking away from St John’s Co-Cathedral, you smell something good in the air and go in search of lunch.